SunOpta, Inc. (STKL) recently hit a new multi-year high on a strong Q2 earning surprise of 57% from early August. With a bullish next-year estimate of 27%, this Zacks #1 rank stock has plenty of upward momentum. SunOpta, Inc. manufactures and markets natural and organic food products in Canada, the United States and Europe and has a market cap of $410 million. It’s no secret that a growing legion of consumers have committed themselves to the benefits of healthy eating by going organic or natural. That trend helped SunOpta deliver strong Q2 results on August 12 that handily beat expectations. Revenue for the period was up 9% from last year to $236 million. Earnings also came in strong at 11 cents, 57% ahead of the Zacks Consensus Estimate, pushing the company’s average earnings surprise to 93% over the last three quarters. SunOpta complimented its strong top-line growth with strong expense management, where its gross margin increased more than 5 percentage points from last year. The company also emerged from the quarter with a much improved balance sheet, with cash and equivalents up $16 million to $38 million while its total debt fell $77 million to $108 million. We saw some pretty solid movement in estimates off the good quarter, with the current year gaining 18% to 33 cents. On the valuation front, shares trade at a slight premium to their peers with a forward P/E of 19X against 17X. On the chart, STKL recently hit a new multi-year high at $6.31 after spending most of the year trending higher. 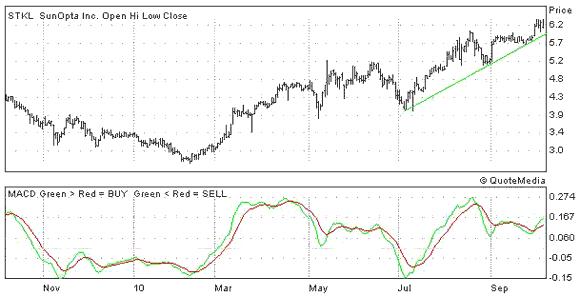 The MACD below the chart looks good too, with the short-term moving average trading ahead of the long-term average. Look for support from the trend line and short-term low on any weakness. Take a look below.